Compatible devices with Qualcomm chipset can charge up to 75% faster compared with conventional chargers. Thanks to Qualcomm QC 3.0 and RAVPower iSmart technology, the charger can simultaneously charge one Quick Charge device (e.g. Galaxy Note, Nexus 6) and one normal device (like iPhone, iPad). 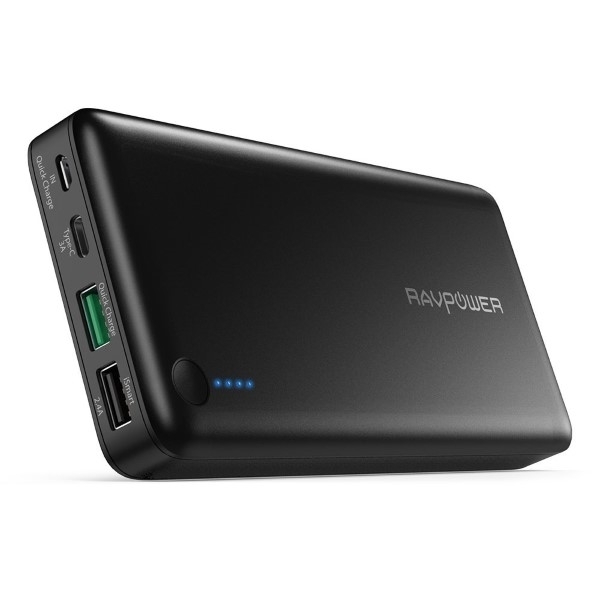 Charge up to 80% of the battery for QC 2.0 / 3.0 compatible devices when charging for approximately 60 minutes. Type-C port is incompatible with the Samsung Galaxy A series phone or Type-C cable or charger of Huawei P10，Huawei mate9 as well as all Oppo & One Plus phone. You can take the portable charger in your carry-on luggage with you on the plane.